I've had blogger open for hours now, I can't think of what to write. So yeah, that's pretty much it. HERE! Enjoy this picture of a double rainbow over the Pepsi distribution center across the road. Also, don't pay attention to the rain drop smudges. Hope you all have a more productive day than me! I love rain. It's raining here today. Not the normal, crappy rain that we get, but AWESOME rain. How does one tell the difference, you ask? Well, I live in Alberta. Most of the time, our rain comes from the tiny wee clouds that puff over the mountains from the west coast and gather themselves into little bundles. Our rain "storms" tend to last half an hour or so, sporadically. I used to live in Manitoba, which is something like 1300km east of where I am now. By the time the above mentioned wee puffy clouds make it to Manitoba, they are a conglomerated mass of huge, rolling, prairie thunderheads. On an average basis, of course. I remember rain storms that would last for days. It is one of the few things that I miss about Manitoba weather - possibly the only thing. Today, though, we have rain! REAL rain! By real rain, I mean rain that lasts longer than 30 minutes. It has been raining since sometime in the middle of the night, and it is still raining! It's supposed to rain tomorrow! Its ridiculously exicitng for me, haha. I have great memories of rain from Manitoba. My mom and I would get dressed in rain boots and jackets, and grab my hot pink umbrella with the duck handle. Yes, the handle of this umbrella was a wooden duck's head with a pink bill. I think she still has it. Anyway, we would go outside and she would let me jump in the puddles, and we would take a walk up our long driveway (we lived in the country) and listen to the pattering of rain on the umbrella, in the trees, on the grass. We would watch the rain bounce up from the puddles and make their little crowns. These days I just try to capture some rain for my plants! When Brianna is a little older, I'll take her out in the rain. Right now, she doesn't like the feel of rain. She will feel it hit her, stick out her hand to make sure, then raise her arms, grab her little head in her hands, and exclaim, "Oh MY!" It is the most adorable thing in the universe. What do you enjoy most (or not!) about the rain? Well, we finished our divination posts back on Thursday. I'm not going to start the next big series of posts until next week, but I'll let you in on what it is - and ask for your input! The next series we are going to cover will be animals. Spirit animals, totem animals, whatever name you feel like calling them. The most common ones out there are wolves and ravens, it seems - There are so many other animals out there with wonderful connotations. So here is the question: What animals would my lovely readers like to see covered? Sorry for the short post today, I'm going to be reveling in the laziness until I start canning cucumber relish later. This will be the end of my series on divination - I've got a great idea for more posts, but we will save that for another day! Today, I'm doing to list a few of the less well known types of divination, and possibly some ideas how to use them. Have you ever heard of an oinomancy and tiromancy party? I bet you have. Oinomancy, divination by wine, and tiromancy, divination by cheese. Alright, maybe they aren't the same thing, but wouldn't that make for an awesome party? I love wine. There is of course the practice of pouring melted wax into cool water, called ceromancy. Possible the strangest type of divination that I've heard of personally is cephalomancy, which is divination with the head or skull of a donkey or goat. Regardless of the method of divination, the Gods will keep speaking to us. Sometimes in the strangest of ways - ways that could almost be called coincidence - we will get messages. We don't even need to search for these signs, because if they are truly signs they will jump out at us. A few months ago I had gone into town with my dad. We were driving in a section of town we don't normally go to, I don't even remember where we were trying to go. We pulled up at a stop sign and I looked up, and there were two words - the name of a God, and a word pertaining to a situation Sean and I were dealing with at the time. It took me a minute to realize what the words actually were, and to realize that if we had pulled up to the stop sign at any angle other than the one that we did, I wouldn't have seen it. It might seem strange, and only coincidental, but that tends to be the way the Gods work. Today we look at the I-Ching, in this wonderful article brought to us by Patrick McCleary, better known as Pagan Dad. Make sure to check out his blog if you haven't already, and you can find him on Facebook as well! The I-Ching, dating back to the beginning of recorded history, this book from the Chinese Taoist system has been turned to for it’s wisdom and as a divination tool. In true Taoist fashion the book speaks of how in the beginning there was the Tai Chi, the Great Ultimate, and from it springs the Yin and the Yang. In the Book of Changes (as the I-Ching is often referred to) the Yin is a broken line and the Yang a solid line. With this the I-Ching can represent a relationship between the forces of Yin and Yang. Now at first glance this way seem to be a limited system with only four relationships expressed. But the I-Ching takes this a step further by grouping three of the lines together, creating a trigram and then even further by pairing two different trigrams together. According to Chinese lore this was done by the mythic ruler Fu-Hsi. This king, with the body of a snake, provided many gifts to mankind. The least of which was the system of hexagrams that comprise the I-Ching. His goal was to unify all things under heaven and earth into a simple framework. Before we move onto how to cast the lines for the trigrams. I wanted to take a moment and dig a little deeper into the system. In each trigram there is a line for heaven, for earth and for humanity. And each hexagram is grouped into one of eight houses, representing the eight primal forces of nature. It is the interaction between these forces, paired with your own intuition that help to predict the shape of things to come. And although there are many ways to cast for the paired trigrams, but the easiest way is the use of three coins. You toss all three coins for each line and add up the totals as such. Heads counting for three and Tails for two. Where there are old (6 or 9) lines, the statements for those lines are read. Additionally, those lines should be converted into their opposites and the proverb for the new hexagram that results should be consulted as well. Meaning if you get a 6 on one line then you would create an additional hexagram, exactly the same just with that one line solid instead of a broken one. You will also notice that I referred to these lines as old and young. Like the universe the I-Ching ebbs and flows constantly. An old line is reaching its end preparing to change into its opposite. Yin into Yang and Yang into Yin. Not it is changing but that will sometime soon. Now that you have created a hexagram, what do you do next? Well that is easy and well not so easy. First you look up the hexagram(s) in the Book of Changes and then you use your intutition in determining how it fits into your life. Each line is paired with a small piece of text which you must meditate on. There are many books available and of course the internet that will help you to interpret the different trigrams and hexagrams. I have included some links below to get you started. Well folks, here is life at the moment. We have been dealing lately with my Grandfather, who is a few provinces away and very ill. The prognosis doesn't look good, and my parents are essentially waiting for the midnight phone call. While we have been preoccupied with that (on my Dad's side of the family) of course other things have been going on. Over the weekend, my Uncle Bob (Mother's side) lost his battle with Cancer. He was in a lot of pain, and so it is a blessing for him not to have to deal with that any longer. He had been diagnosed with Cancer over last winter. So needless to say, I've had a pretty draining weekend. There were some successful endeavors however, but I will leave that for another day. Bibliomancy is my preferred method of divination. Most people have heard about it, even if they don't know it by that name. Have you just opened a book and let the pages fall where they may, looking to see which passage caught your eye? That is the beginning of bibliomancy. Many people I know who are Christians do this; they hold open their bible and let the pages fall, and put their finger on a passage. It helps to have the person who wants their question answered holding the book, but when someone has been doing bibliomancy for years they can do readings for people other than themselves simply because of their practiced ability to change the energy flow from their hand. How bibliomancy works, or at least how I have perceived it to work in my years of doing it, is that the book is responding to the vibrations of energy coming off of your hand. This is why it can work for anyone who just holds open a book. Those who work with energy on a regular basis can also do it a different way, by holding the book closed and hovering your hand over it. Your fingers will be drawn to the place the book should part. They next part of bibliomancy comes in choosing the proper passage. Generally, this will be the first one that your eyes are drawn to when you look at the page. If you can't make sense of the reading, don't try again with the same book. You should never use the same book twice in the same reading. I once had three different books give me the same answer when doing a reading for a friend. It is situations like that which tell you that this is a working method of divination. Twice can be coincidence, but I don't think three times is. Which books should you use? I know some people that refuse to use fiction. I know some that use only religious books. I personally use whichever book feels right. I strongly feel that there is value in every written word, be it fiction or not. My favorite books to use for bibliomancy are classics; simply because many people know of them and can identify with them. The Hobbit and the Lord of the Rings series, books by Charles Dickens. The writings of Virgil and Homer. Regardless of what you chose, be sure that the book calls to you. If it feels like the right one, then it is. If you don't feel a thing, then move on to the next one - you won't get a good reading out of a book that you don't connect with. Bibliomancy is a good way to get advice about things, because everyone connects with the written word. I actually offer bibliomancy readings on Fiverr.com, but I won't link it here unless someone asks because I don't want to be spammy! If anyone needs some help trying it themselves, feel free to give me a shout. Another break from divination posts, tomorrow we have my personal method of divination coming up! Today, I'll direct your attention to the top of the right side column, where there is now the picture of Brianna in the contest and the different entries to vote for! New category in Toddlers and Tiaras: best angry princess expression. How Dare You! I am THE Princess Dammitt!! If the crown doesn't fit, does it mean I'm not a princess? Voting will run until September 1st at 10am. The one with the most votes wins!!! In our modern times, Tasseography is generally known as reading tea leaves. The word itself has nothing to do with tea, however, it has to do with cups. The french word for cup is tasse, and anything you drink from a cup that leaves some type of sediment can be read. This includes wine and coffee. 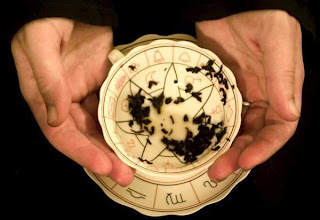 For reading tea leaves, there are some really awesome cups that can be found with the zodiac on them and other hints to help you read the leaves. Essentially, with tea leaves and with other sediments, what you are doing is analyzing the shapes. Herbal teas do count as they leave a sediment. It is best for the coffee and tea readings if you put the leaves or grounds directly into the water. A white or light coloured tea cup is best. If the cup is too dark or has a dark pattern, you won't be able to properly read the leaves. The nature of reading sediments is that you need to recognize shapes. It is a good idea to clear your mind before hand. Who is most qualified to read your leaves? Generally it is you! Everything is subjective, and you will see things that you need to see that others may not. Some people divide the cup into three sections, base, middle and rim. There is an exhaustive list of what the symbols can mean. There are probably as many different ways of reading tea leaves as there are those who do it, and you can find several online resources that are great. Step by step instructions can be found at Tasseography.com which are marvelously in-depth and include a list of symbols at the end. After looking through the instructions this is definitely one type of divination that I'm going to try! If nothing else, the tea will be delicious! Continuing with the divination posts my wife has asked me to write an article for her. I am not as accomplished a writer as she so here goes. Astraglomancy, also known as astragyromancy or cleromancy is the art of divination using dice. The first recorded use of what we know as modern dice was around 1400 B.C. by the egyptians, which is unsurprising as they seem to have invented most really important things back then. Although I can't find any references to the egyptians using dice for divination, there are records of the romans, greeks, and tibetans using various forms of this method as far back as 400 B.C. The Shona people of Africa have used a form of dice divination for thousands of years and still do to this day. The earliest forms of astraglomancy were conducted using the knucklebones of quadraped animals such as sheep. Symbols were painted on each of the 4 sides and meanings taken from the combination of symbols and the places where they landed. The Shona have a similar system using flat bones marked on two sides with carved symbols. The "dice" are thrown before any venture or journey is taken and the results tell the thrower whether fortune favors the thrower. If an unfavorable result is thrown the business or journey will be delayed for days until the dice show the fortunes have changed. The Dalai Lama of tibet regularly uses the MO, or tibetan dice divination to assist in making decisions. Extensive writings by previous lamas assist him in interpreting these rolls. The "dice" used by the tibetans consist of balls of dough with various possible decisions written on slips of paper placed inside. The most accepted modern method of astraglomancy is done with 2 regular dice. First one draws a circle roughly 12 inches in diameter on a white piece of cloth and divide the circle into 12 equal sections. Each segment in between the lines is numbered with the first starting as 12 at the top, to the right of the 12 o clock position, and working your way clockwise around the cloth to 1. Then two dice are placed in a cup and rolled onto the cloth by the querent. Many practitioners of cleromancy, or 2 dice rolling, say the throw should be done with the left hand, whereas gypsies practicing the same method will have the roller use the right. The position of the dice on the cloth effects the results, and if a die rolls off the cloth the result of that die is ignored. If both dice roll off the cloth a second throw can be attempted, but if that throw results in both dice again failing to stay on the cloth then the attempt is over as a third roll can mean bad fortune for the roller. Here is the simplest form of cleromancy I could find information about. First draw a circle 12 inches in diameter on a white cloth or paper. Lay the cloth on a flat surface and holding 2 everyday dice concentrate on your question. This method will work best with yes or no questions. Toss the dice onto the circle and, if both dice land within the circle add the results and consult the chart below. If one die falls outside the circle ignore that die and use only the number on the one still inside the circle. If both dice land outside the circle you can attempt a second roll, but if the second roll results in the same result no third roll should be attempted, the dice will not answer your question this day. This is a nice simple method of quick divination that can be done anywhere with a pair of dice and a round white cloth. This can also be done with three dice with a greater range of answers. Lists of answers can be found at Psychic Revelation and Magick7. Well that's my post on dice divination. Thanks for sharing your time with me and I'm sure Stacy will be back with more interesting posts next time. Thanks all, Sean. Tomorrow we will get back to our divination posts. Today, we have pictures!! I managed to choose only 4 pictures to show you all: First we have Brianna trying to stick her head out of the Gondola. On the left side, you can see that Sean has a death grip on the Gondola doors! LOL. I'll spare him the embarrassment of showing his pale grey, horrified face. Poor Sean. What a way to discover a fear of heights! 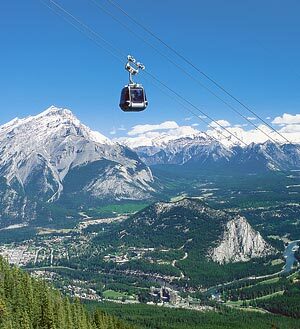 Here we have the view from the top of Sulfur Mountain; This is where the Gondola takes you. Here we have Brianna, after she learned to get dirty. She is actually still fairly clean in this picture. Her bum is such a mess, she sat in mud! We took a trip to the Bow River Falls. Sean collected a bunch of flat rocks to use to make his own rune set. He eventually went wading further out to get more. The water was ridiculously cold! There a million more pictures. Okay actually only like 450. If anyone wants to see more pictures, let me know and I'll post some! Back from vacation today. We had a wonderful time, I'll post pictures sometime next week. I love the mountains. You all remember the Gondola, from my last post? It is the third picture down. If you don't remember it, go look. I'll wait. Okay good! Now, I love the mountains. We learned, however, that Sean does not. Where did we learn this? Shortly after we had gotten into aforementioned Gondola. Poor Sean. It was pretty hilarious to me, because people are always bugging and teasing me about MY phobias, Sean included. Regardless, he made it down to the ground in one piece, although he *may* have had a heart attack on the way down because Brianna was enjoying sticking her head part way out of the Gondola window. She obviously doesn't share her father's fear of heights, thank the Gods. Speaking of Brianna, over the course of our vacation she has learned (*sigh*) how to get dirty. I know, I know. It's a child's job to get dirty. That doesn't mean I have to enjoy cleaning up the mess! The first day up in the mountains, every time Brianna would touch the dirt she would get us to wipe her hand off. By the third day, she was sitting in mud she had made herself (yay buckets of water) with dirt streaked on her face. It was awesome to watch her play, but then she stood up and all I could think of was HOW was I going to get those pants CLEAN? I'll have a picture for you ( I think ) next week. We may have just thrown the pants out, I don't remember. Pine sap is pretty hard to get out of sweatpants fabric. We did a lot of shopping, and came home with 20 dollars of our shopping money anyway! I was quite impressed with myself. There is a drum that was far beyond our price range, and we are going to save up and go back for it. It was a beautiful drum! However, that is just the vacation. That says nothing about what happened before the vacation. We were supposed to be picked up (we were all going to stay in my parent's camper trailer) at 8am that morning. At ten to eight, we got a call from my mom. The brakes on the trailer weren't working. It's all very technical and I won't bore anyone with that; suffice to say that it took a trip or two to town (I brought my dad coffee while he was fixing the trailer) and lots of running around for new parts. Then, I get back from my last (so I thought) trip to town, tell Sean that the trailer will be fixed in about 30 minutes (finally. This is at like, 10am.) I go into the fridge for something, and it's warm. I'm thinking to myself, "Why is it warm? Wait, the light isn't even on..." So I asked Sean what the heck, and HE says, "Oh, that must have been what that noise was." So we checked, and sure enough the motor in our fridge had died a horrible, painful, burn-y death. Why burn-y? Because it was crazy hot and smelled like something had caught on fire. So I called my mom and we decided to move all of our stuff from our fridge into their fridge and freezer while we were gone. So we bagged up everything out of our fridge and freezer, carted it over to my mom and dad's house, and then finally went home and they came to pick us up with the trailer. It was crazy, but really. Thank the Gods the brakes hadn't worked, otherwise we may have come home to a smoldering ruin of a house! I think that is all I have to tell for the moment - we got our new fridge on Tuesday, my Mom and Dad decided to buy it for us because they are awesome. Hope everyone had a great week! I'm so excited. Sean is counting down the hours, he sent me a text at about 11am today, and he said, "This time tomorrow we will be looking at mountains!!!" Ha. It will be Brianna's first time seeing mountains. Yes, hence the lack of postingness. So, we are leaving tomorrow morning, and we will be back sometime next week. Don't know the day yet! Hope you all have a wonderful week. I'll share pictures when I get back, promise! **All pictures are property of their respective sources and/or photographers.